Purchased prepared basil and Parmesan pesto give these oven-fried chicken breasts plenty of great flavor. The chicken breasts are pounded to thin out then they're coated with pesto and a panko bread crumb mixture and baked to crispy perfection. If you have fresh basil, make the pesto from scratch in your food processor. Follow the easy instructions below the recipe. Serve these flavorful coated chicken breasts with a tossed salad and your favorite steamed vegetables for a delicious everyday family dinner. Heat oven to 400. Lightly grease a baking pan large enough to hold the chicken in a single layer. Gently pound the chicken breasts between sheets of plastic wrap to an even thickness. Alternatively -- especially if the chicken breasts are large -- slice each chicken breast half horizontally to make two cutlets. In a food processor,* pulse the panko and dry bread crumbs with the Parmesan cheese (if using), paprika, salt, and freshly ground black pepper until well combined. 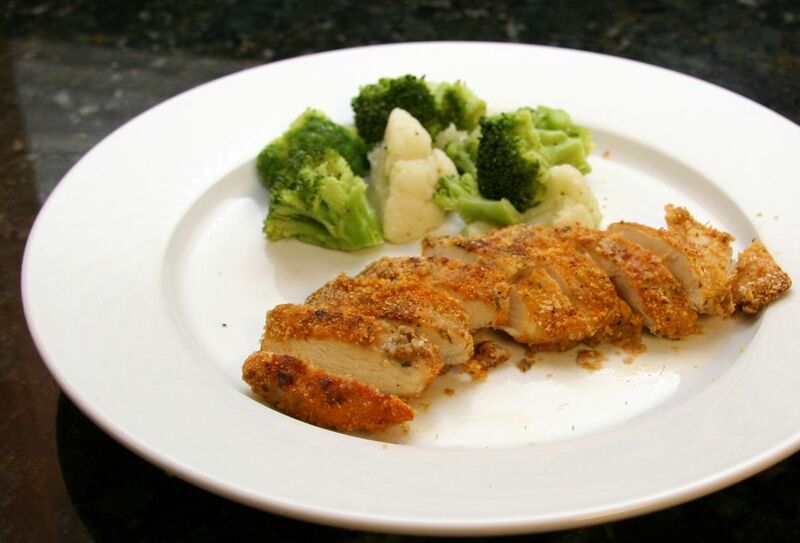 Rub each chicken breast with about 1 to 2 teaspoons of pesto, then press in the crumbs to thoroughly coat. Arrange the chicken pieces in the prepared baking pan and bake for about 20 minutes, or until chicken is cooked through. The minimum safe temperature for poultry is 165 F (74 C). If in doubt, check the chicken pieces with an instant-read food thermometer. *Skip the food processor step if you like the texture of the larger panko bread crumbs. Just combine the crumbs, Parmesan, and seasonings in a bowl and blend well. Substitute about 1 1/2 pounds of chicken tenders for the chicken breast halves. Replace the plain bread crumbs with garlic seasoned bread crumbs or use all panko crumbs in the recipe. Easy Homemade Pesto - Chop 1 cup of basil leaves (packed) and put them in a food processor with 1 teaspoon of chopped garlic and a tablespoon or two of pine nuts, pecans, or walnuts. Pulse a few times and then add 2 tablespoons of olive oil while the machine is running. Add 3 tablespoons of fresh grated Parmesan cheese and blend thoroughly. Season with salt and freshly ground black pepper, to taste.